^ （英文）Hamlin, Talbot. Architecture through the Ages. New York: Putnam, 1953. p.30. ^ （英文）Badawy, Alexander. 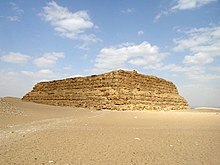 Architecture in Ancient Egypt and the Near East. Cambridge: MIT P, 1966. p.46. ^ （英文）Ancient Egypt and the Near East. Cambridge: MIT P, 1966. p.7. ^ （英文）Arnold, Dorothea. When the Pyramids were Built: Egyptian Art of the Old Kingdom. New York: Metropolitan Museum of Art, 1999. p.12. ^ （英文）Badawy, Alexander. Architecture in Ancient Egypt and the Near East. Cambridge: MIT P, 1966. p.51.